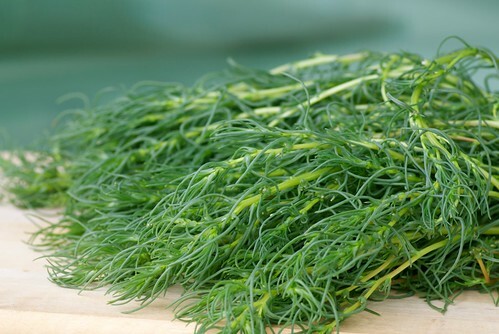 Food Blogga: What is Agretti? A couple of weekends ago at the Little Italy Mercato, as I was peacefully sorting through ears of sweet corn, I heard a woman scream, "Oh, my God! I can't believe it!" Curious, I followed the voice, and noticed a woman a few tables ahead with her arms waving wildly in the air. She was talking rapidly and loudly and began jumping as if she were standing on hot coals. "Oh, my God! I haven't seen that since I lived in Italy," she exclaimed. What? What hadn't she seen since she lived in Italy? Gargantuan globe artichokes? We have those in San Diego. Mint green Vespas? Got 'em. A hot Italian guy? We have many of them, especially at Sogno di Vino and Bencotto in Little Italy. You're welcome, ladies. Turns out what thrilled her was finding agretti, a springtime Mediterranean succulent, or water-retaining plant. With its verdant color and feathery texture, agretti looks like a cross between fennel fronds, rosemary, and grass. After talking with Bob Polito of Polito Family Farms, I learned that agretti's season is very short, typically a few weeks, in late spring. So if you spot some, buy it! I expected raw agretti to be soft like dill, but it was quite firm and crisp with a robust, grassy flavor. 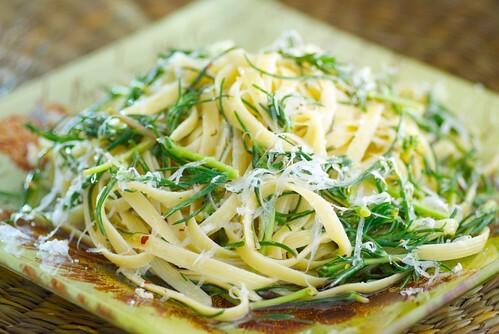 In fact, the day after I served this Fettuccine with Agretti, Lemon, and Olive Oil, I asked Jeff what he wanted to bring for his lunch. He said, "Got any leftovers of that pasta with grass? That was awesome." Where can you buy agretti? Agretti is a rare find. Your best bet is a local farmers' market or CSA that offers Mediterranean produce. You can also try growing your own, but it can be difficult since agretti is typically grown along the edge of salty marshes. How do you store agretti? Place them inside a brown paper bag, or wrap them with paper towel, and place in the crisper drawer of your refrigerator. They should last 2 to 3 days. How do you cook with agretti? First, cut off any yellowed or overly thick stems, then chop. Agretti can be eaten raw, chopped and tossed into salads; it can also be boiled, steamed, sauteed and stir-fried. Some people prefer cooking it a long time until very tender, but I prefer it cooked quickly and lightly so it retains its color and bite. What can I substitute for agretti? With its unique grassy flavor, there isn't another succulent or green that tastes identical to agretti. However, tart, firm purslane would be a good substitute as would more bitter dandelion greens. 1. Saute lightly in extra virgin olive oil, and douse with fresh lemon juice and a sprinkling of salt and pepper. It pairs well with chicken, fish, and lamb. 2. Saute lightly in extra virgin olive oil with bacon or pancetta and drizzle with a balsamic reduction. 3. Saute lightly in extra virgin olive oil, and fold into softly scrambled eggs with grated Parmesan cheese and lots of black pepper. 4. Saute lightly in extra virgin olive oil and use as a crostini or pizza topping with fresh mozzarella cheese, and cherry tomatoes. 5. Toss with arugula, escarole, and radicchio and drizzle with a tangy lemon vinaigrette for a full-bodied Italian salad. If you can't find agretti, then your best substitutes would be either purslane or dandelion greens. 1. To prepare the agretti, cut off the bottoms of any thick stalks. Rinse well under running water and pat dry. Using a sharp knife, chop into small pieces. 2. In a large skillet over medium-low heat, warm olive oil. Add garlic slices and cook until golden brown and fragrant. Remove garlic from the pan and discard. Add the agretti, and cook about 5 minutes until wilted yet still firm. 3. Meanwhile, in a deep, heavy pot, cook pasta in salted water according to directions, until al dente. Drain and add to the skillet with the agretti. Add the lemon zest and juice and toss. Divide among plates; drizzle with extra virgin olive oil and sprinkle with a little cheese. Serve immediately. I don't know if I'll ever come across this, but now I know if I do, that I have to try it! I am completely intrigued now! You've given me a new food shopping obession -- to find agretti. Thanks for the great tutorial for when I locate it. Very fun. I've never seen this before but I'd love to try it. I've never heard of these before! I'll have to keep my eye out...I wonder if Eataly has them! At first I thought it looked like dill! I'm totally intrigued too, and will put it on my list, my next trip to the city. I think they must be the same. In Mexico, romeritos are available even in grocery stores when in seasons, especially for Lent. Now I am very, very curious. Susan, I just had my first taste of agretti last night. My CSA farmer is growing it. For dinner I threw some in a frittata with fresh basil, zucchini and Parmigiano. I want more! This is amazing! Now I'd have to search where I can find agretti here in the east coast.You have me convinced! Thanks for sharing.I love it when I learn something new. I LOVE trying new foods. Now I'll have to seek out some agretti! I am intrigued. How cool, Susan! Agretti is totally new to me. This should be a question on one of those food trivia games. thanks! Agretti is new to me. Your pasta looks delicious, though. When I do run into it now I know what to do. Very informative post! Fantastic find! I'm going to start asking around among my farmer friends to see if anyone is growing it. Wow, agretti is a completely new herb for me, have never heard of it before. My closest option is to fly to Italy...not a bad idea actually. I think I will be on an agretti hunt this weekend at the Ballard Market.. I can't believe you found this at the Little Italy Mercato!!! I can't wait to get back to SD and cook with it: I JUST tried this is in Italy and loved it! (Well, I HOPE what I tried was agretti... is this funny green also called "Barba di Frate" or "priest's beard" in Italian?) Looks/sounds similar. Either way, thanks for sharing and getting me so excited to come back to SD after spending a year away! I'm so sorry for the delayed response, everyone. We were away on vacation. Thanks for your excitement though. Isn't agretti amazing? I'm so glad I have given many of you a "shopping obsession," as FJK says. serena-Keep looking. I know it's there somewhere! victoria-Thank you for introducing me to romeritos. Intriguing connection, one I'll have to explore further. karen-Mmmm... it must have been wonderful with the basil and zucchini. Sublime summer flavors. caroline-Thanks for sharing that lovely recipe. I love it! We're big on pasta with grass in my house. Will keep an eye out for this new (to me) ingredient. Thanks for the tip. Fantastic! I love learning about interesting hard to find produce. And, I love coming across items that make me declare "I haven't seen this since...." It makes me feel like a kid at Christmas. I learned something new today! I have never seen Agretti and I live in NJ with tons of Italian Americans, including my hubs. to Amanda Jones: Yes , Agretti is called Barba di Frate in Italy, according to Wikipedia. I just got some seeds, and am looking forward to attempting to grow it. I'm going to try to grow it this year. I purchased agretti at Chino's Farm (the vegetable shop) in Rancho Santa Fe both last Saturday and today. I am lucky enough to live in Italy and found it yesterday after seeing it on an Italian cooking programme. 1st attempt, just steamed. Great. Tomorrow, scrambled eggs with smoked salmon and raw agretti with salad from my garden. Wonderful find, very good for you.